Between pieces of plastic wrap or waxed paper, place each chicken breast, smooth side down; gently pound with flat side of meat mallet or rolling pin until about 1/4 inch thick. In small bowl, mix bread crumbs, Parmesan cheese, garlic salt and basil. In another small bowl, beat egg with fork or wire whisk. Dip chicken into egg, then coat with crumb mixture. In 12-inch skillet, heat oil over medium heat. Add chicken; cook 5 to 7 minutes, turning once, until juice of chicken is clear when center of thickest part is cut (170°F). Remove from skillet; keep warm. Pour soup into skillet; heat to boiling over medium-high heat. Boil 4 to 5 minutes, stirring occasionally, until slightly thickened. Return cooked chicken to skillet; reduce heat to low. 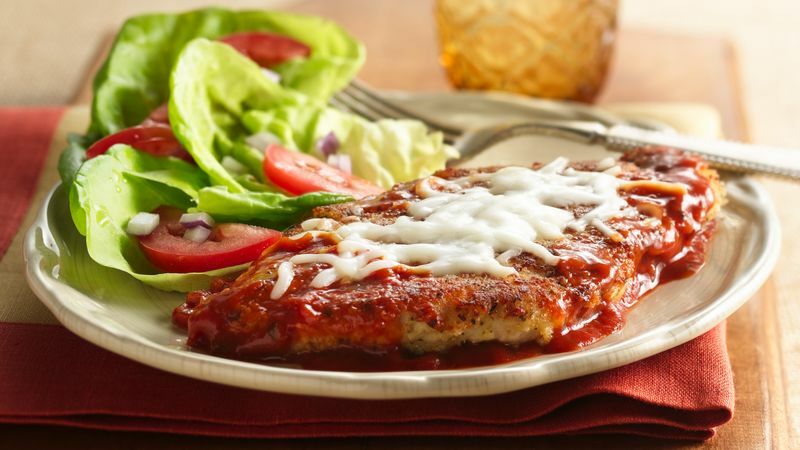 Sprinkle mozzarella cheese over chicken. Cover; cook 2 to 3 minutes or until cheese is melted. Serve with steamed broccoli and crusty rolls.